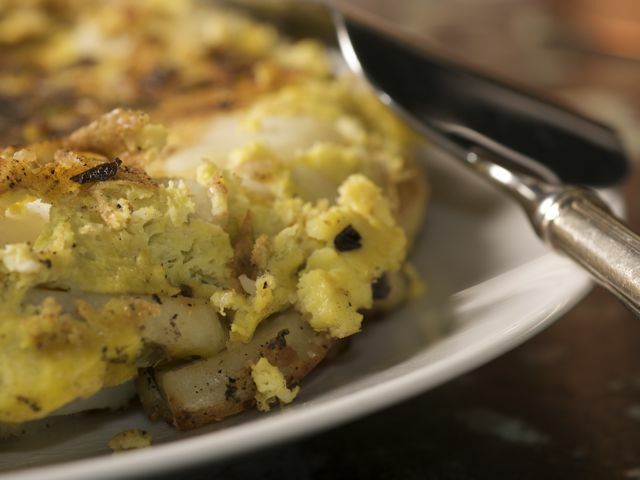 Tortilla Española is an indispensable dish: It makes a great breakfast, goes well in a sandwich, and makes a hearty hors d'oeuvre when cut into small squares. The only challenge is removing the tortilla from the pan intact, but you can cheat by waiting until it's cold. Embellish the tortilla with stinging-nettle pesto, Cilantro-Jalapeño Sauce, or plain ketchup. Peel and quarter the potatoes. Cut the quarters into slices ¼-inch thick. Heat a large ovenproof sauté pan over high heat and add 3 tablespoons of the olive oil. Add the potato slices and cook until lightly browned, about 5 minutes. Decrease the heat to medium and cook, stirring frequently, until a fork sinks into the potato slices easily. Remove the potato from the pan and set aside. Return the pan to medium heat and add the remaining 2 tablespoons olive oil. Add the scallions and sauté until tender and lightly caramelized. Decrease the heat and add the potatoes. Season with salt. Spread all the vegetables evenly across the pan and pour the eggs over the vegetables. Sprinkle the cheese evenly over the eggs and bake for 15 minutes. The surface should be firm and springy. Loosen the edges from the pan with a knife and flip the tortilla onto a plate to serve, or flip it after it has cooled. The tortilla may be served hot or at room temperature. Slice into wedges and sprinkle with pepper before serving.